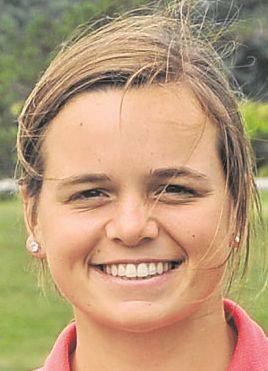 CELINA — Lima Central Catholic claimed the girls Division II girls golf championship Tuesday at par 72 Celina Lynx Golf Club. Medalist Mary Kelly Mulcahy (74), Erin Mulcahy (77), Meghan Mulcahy (82) and Hannah Garver (90) combined for the Thunderbirds’ winning score of 323. Wayne Trace (383) and St. Henry (385) also qualified districts with second and third place finishes respectively. St. Henry advanced by winning a playoff against New Bremen. New Bremen’s Sara Parker (74), Bluffton’s Alivia Koenig (88) and Minster’s Taylor Homan (93) advanced as individuals not on qualifying teams. Delphos Jefferson’s Sydnie McGue (96, Coldwater’s Emma Eckstein (98), Lincolnview’s Shiann Kraft (99), Allen East’s Kasey Meyer (100), Cassidy Werts (100) of Delphos St. John’s, Paulding’s Hailey Hartzell (100), Bath’s Annabelle Burkholder (103), Fort Recovery’s Jalyn Bruns (105), Ottoville’s Allie Honigford (111), Fort Jennings’ Alexis Stant (121), Marion Local’s Emily Nietfeld (123), Ridgemont’s Mackenzie Rader (135) and St. Marys’ Eva Youngs (139) had the low rounds for their schools. DEFIANCE — Ethan White and Nolan Unterbrink each had a goal. White, Ethan Alt and Connor Niese each had an assist. Ethan Alt made nine saves in goal for O-G.
VAN WERT — Logan Johnson, Tyler Long, Seth Mahlmeister and Draek Littler each had a goal. Payne Harshbarger had two goals and Hunter Coffey, Kyle Lenhart and Luke Beach each had one. No other information was reported about this match at deadline. The Three Rivers Athletic Conference match was called in the second half due to lightning. KALIDA — Kalida’s Gabe Hovest and Botkins’ Zane Paul each had a goal. BLUFFTON — Bluffton’s Jayden Mays, Jackson Steinmetz, Asher Antrim and Brandon Good and Ada’s Chris Reyes each had a goal. Angel Brzozowski made three saves in goal for Continental. MILLER CITY — Kinsey Helser had two goals and Madison Ellerbrock scored one. FORT JENNINGS — Maddie Mconnahea had a goal and teammate Michelle Rode made 11 saves in securing the shutout in goal. The Bulldogs won 27-25, 25-18, 25-19. Haley Radabaugh had 11 kills, Rylee Sybert had 11 kills and 16 assists, Becca Choi had 21 assists and Abigail Gladwell had seven digs for Grove. OTTOVILLE — The Big Green won 25-18, 25-18, 25-17. Quinley Schlagbaum had 13 kills, 18 digs and four aces, Brynlee Hanneman had 16 kills, nine digs and three blocks, Kylee Hoersten had 37 assists, Madison Averesch had 14 digs and Sydney Brinkman had 12 digs for Ottoville. P-G stats were not reported by deadline. ADA — The Knights improved to 10-3 overall and 4-1 in the Northwest Conference with the 25-18, 25-23, 25-21 victory, dropping the Bulldogs to 8-4 overall and 3-1 in the NWC. Maddy Lamb had 19 assists and three aces, Avery McCoy had nine kills, Lauryn Black had eight kills and 15 digs, Lexi Gregory had seven kills and 18 digs and Bailey Gregory had 26 digs for Crestview. MILLER CITY — The hosts won 25-15, 24-26, 25-16, 25-12. Sofie van Wezel had 12 kills and three blocks, Kylie Berner had 11 kills, Kate Kuhlman had eight kills and five blocks, Brittany Kuhlman had 35 assists and 16 digs, Abi Lammers had five kills and 16 digs and Cayla Troyer had 21 digs for Miller City. Grace Klausing had 11 kills and 20 digs, Morgan Mock had 15 kills and 18 digs, Camryn Hoffman had 22 digs and Tara Gerding had 32 assists for Kalida. BLUFFTON — The Pirates won 25-11, 25-23, 25-18. Katie Prater had 11 kills and 10 digs, Ameri Siferd had seven kills, 10 assists and four aces, Libby Schaadt had seven kills, Kylie Stackhouse had seven kills, Skyler Scoles had 21 assists and Madison Fleece had 10 digs for Bluffton. Spencerville’s stats were not reported by deadline. LIMA — The Spartans won 25-22, 25-18, 25-13. Anna Acklin had eight assists and three aces, Sophie White had 26 digs and Lizzie Helser had five kills for Temple Christian. Lima Senior’s stat leaders were not reported by deadline. The Lancers won 25-22, 28-26, 25-16. Kristin Whitley had seven kills, Anamya Truex had six kills, Grace Howard had five kills and Summer McCloskey had 19 assists for the Mustangs. Madison Williams had 14 kills and 13 digs, Carly Wendel had 12 kills and four blocks, Lakin Brant had 33 digs, Brianna Ebel had 29 assists and 22 digs and Kendall Bollenbacher had 15 digs for Lincolnview. CELINA — The Cavaliers won 25-17, 25-10, 15-25, 25-21. Lauren Gilliland had 18 kills, Annalise Harlamet had 30 assists, Katie Alig had nine digs and Annalise Harlamert had four aces for Coldwater. Maddy Luebke had 11 kills and nine digs, Brooke Robbins had 10 kills and eight digs, Becca Stein had nine digs and Samantha Carlin had 27 assists for Celina. The Redskins won 25-10, 25-11, 25-2. Chloei Barnett had nine aces and eight digs, Emma Nolte had six aces and eight assists, Emma Rex had 10 digs, Emma Horner had eight digs, Makenzie Wilson had 11 kills and five blocks, Kelsey Fullenkamp had seven kills and Renae Schulze had 17 assists for Wapak. Four Midwest Athletic Conference teams are ranked first through fourth in the latest OHSVCA Coaches Poll. St. Henry (37 first-place votes, 410 points) is atop the Division IV rankings followed by New Bremen (one first-place vote, 319 points), Fort Recovery (299) and Marion Local (221). Leipsic (197) and Jackson Center (163), which each received a first-place vote are fifth and seventh respectively. Ottawa-Glandorf received 17 first-place votes and had a total of 383 points to be ranked second behind Huron (19, 432) in D-III. Coldwater (80) is 10th. No area schools are ranked in D-I or D-II. BATH TOWNSHIP — The Bath Invitational has been postponed until today due to inclement weather. For more information contact the school at 419-221-0366. LIMA — Tickets for Friday’s Lima Senior game at Fremont Ross High School will be available in the Lima Senior Athletic Office from 9 a.m. to 4 p.m. Thursday and from 9 a.m. to 3 p.m. Friday. Presale tickets are $5 for students and $7 for adults. All tickets at the gate are $7. Kickoff is at 7 p.m. at Don Paul Stadium, 1072 Miller St., Fremont. Visit limaspartannation.org for information on purchasing tickets, schedules and more.